Bulk & Plastic. It is pretty common knowledge that our consumer lifestyle in the developed and developing world is the source for the islands of plastic now floating in our oceans. We have come to rely on this petroleum based material in almost every aspect of our lives. And its downside affects us from all directions, both environmentally and economically. There is no doubt about it. We are trashing our planet (see below for links to websites). Deep ecology proponents would have us go to the root of this human issue by asking us to find our way back to our love for the natural world, for our planet, for Gaia. Ultimately, this perspective of our human lives could well save us from the possible extinction we face. In the meantime, however, there are some immediate ways we can walk more lightly. As we explore how co-ops can change our world this year, it makes sense to explore how store operations and current trends contribute to a more sustainable world. There are numerous directions from which to address this issue. One big one for our staff, in terms of plastic use at the Co-op, is in encouraging our members to shop in the bulk department as much and as often as possible. Many of the dry goods that can be found packaged – often in plastic – in the aisles can also be found in this department. We can repeatedly reuse our own containers – preferably glass and biodegradable bags – and in doing so, contribute to the move away from this insidious packaging material. Sales in the bulk departments at both markets, however, have been in decline recently, each year showing fewer sales in total than the year before. There are probably many reasons for this trend, one being the convenience factor. 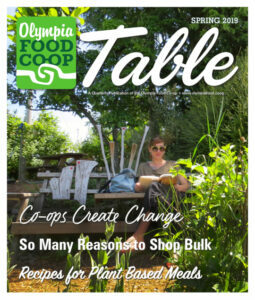 To counteract this, Barbara, manager at the eastside bulk department, has found that if she packages some of the more snacky items, they fly off the shelves – a symptom of a trend in member shopping that is happening at co-ops in other places also. Grab and Go is becoming more and more popular. Time, or more precisely lack of it, has become one impediment to embracing this way of shopping for our food. It takes more time to shop in the bulk aisles. And after a long day of work, with daylight hours short and hungry children to feed, or even just needing to feed ourselves, taking the time to bring in containers, or find recycled ones in the store, weigh their tares, scoop out or pour in product, write down PLUs and take them to the register, is often just too much. And yet, we want to do our part to lessen our footprints on the planet, yes? And we appreciate the money saved by bulk shopping too. What a dilemma! With bulk sales on a declining trend, compared to other departments, adjustments to our store sets may be in order. We want to provide space for what our members really want to find at the Co-op. In order to move bulk product at the Co-op in a timely manner, and to help mitigate the financial loss caused by less of us buying in bulk, reductions in what is being offered has to be considered. Our bulk managers are constantly working to keep a variety of staples in stock, at the best price and quality possible, while also working in some more interesting variety. But ultimately decisions are now being made that are necessary for the Co-op to function in a financially sustainable manner. We’d love to hear from you! If you have ideas about what works or doesn’t work for you in shopping our bulk departments, products you love or products you find yourself buying in grocery instead, please let us know what you think! We can always be reached at our customer service email. In the end, each of us must examine our own shopping habits and determine how best we can do our part in controlling the flow of plastics out into our world. Worldwide, 13–15,000 pieces of plastic are dumped into our oceans every day. At least 2/3 of the world’s fish stocks are suffering from plastic ingestion. 100,000 marine creatures a year die from plastic entanglement. 1 million sea birds die each year from plastic ingestion. The Great Pacific Garbage Patch, twice the size of France (or Texas), off the coast of California, is a swirling whirlpool soup of plastic in many sizes, being created by ocean currents. Plastic is literally at our fingertips all day long. Plastic keyboard. Computer monitor. Mouse. Ball¬point pen. Toilet seat. Steering wheel. Beads in facial scrubs and toothpaste. And on and on, and much of which makes its way to our landfills and oceans.